In 1962 I fell passionately in love with the sound of the flamenco guitar and the music of Nino Ricardo. 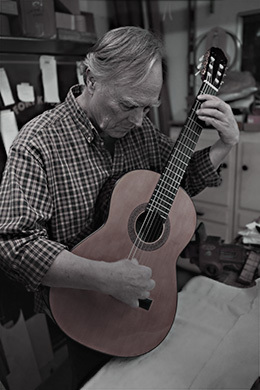 By the early 1970′s I was able to quit my day job and pursue guitar building full time, as well as fulfilling orders to build lutes and other early stringed instruments. It was through my friendship with Henri Besancon (the late great Orange County flamenco guitarist and instrument repairman) that I was able to play and examine the finest guitars that came into his shop in the 1980′s. I was drawn to the guitars of Miguel Rodriguez and it was through the study of these wonderful instruments that I discovered an approach to sound that I have applied to my own guitars. Today I use the finest quality air-dried wood available, and each guitar is assembled under strict humidity controlled conditions. I employ traditional methods from the construction of the rosettes to the French polish applied to every instrument. Ron Hachez ©2012. All Rights Reserved.